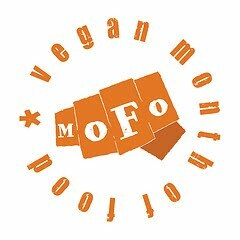 Join me as I continue blogging onward through "A Month Of Vegan Gravies" for Vegan MoFo. Cauliflower is abundant and cheap in the winter farmer's markets around here, so we loaded up on the weekend; In fact, one of the market sellers told me our valley here in the shadow of Mt. Rainier grows cauliflower commercially for most of the grocery stores in the US! Here's what lil' Sprout requested we do with the cauliflower tonight. 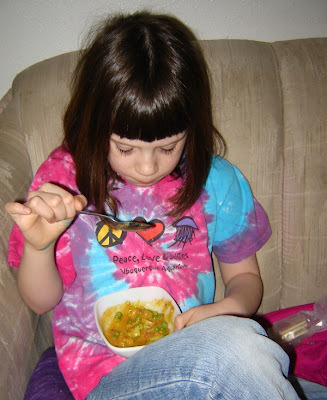 She LOVES all things curried and spicy, VERY spicy. Don't be put off by the long list of spices - they're not difficult to find and NOT "hot", just very flavorful. They're well worth locating. This makes a very flavorful curry. Enjoy. Heat oil in a pan on medium heat. (I use a large, rather deep cast iron skillet.) Add the seeds and stir until they sizzle and "pop". This releases the spices flavor and infuses the oil with it. Add the onion and ginger, stir-fry for a few minutes until onion is starting to brown at the edges. Lower the heat and add in the spices from garlic to curry powder. Stir only a few seconds to get the spices coated with oil and just starting to heat. Add the potato and cauliflower and stir well to mix in the spices. Add the salt. Add the water and let the vegetables cook until tender. I cover the pan and let the veggies cook in their own juices which are released with the salt. Stir every 5 minutes to evenly cook the vegetables, you may want to remove the lid to let water evaporate once potatoes start to soften. Simmer for another 10 min. Turn off heat and allow to sit for a few minutes. This really blends the flavors. This looks so very good. 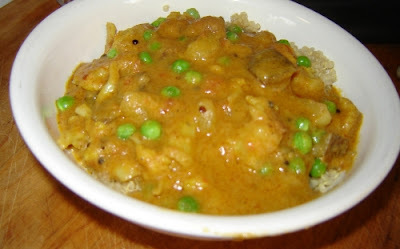 I love when the curry is also a gravy, and I really like it with peas. I'm writing this up on my to-do-list! Looks awesome. Looks great. I have added it to my recipe bookmarks will be making it in the future. I love that picture of Sprout looking at the gravy! Sounds awesome! Yum, yum...I love all things cauliflower. I am seriously loving your month of gravy--you are brilliant! Mmmmm . . . that sounds so good. I love how all your recipes just feel like good yummy comfort food to me! Oh yum! Curry, potatos & peas, oh my. I just replenished almost all of my curry seasonings, so I need to "test drive" them and this sounds really yummy.